Google is integrating technologies such as machine learning or artificial intelligence (AI) in several of its advertising offerings. Google is looking to take the automation of ad campaigns to another level. These changes are accompanied by the name change of previously known Google Adwords brand, which is seeing a rebranding to Google Ads as of July 24, 2018. This rebranding will help Google put all its advertising services: Search, YouTube, Display , Apps, Maps and several others under one umbrella. 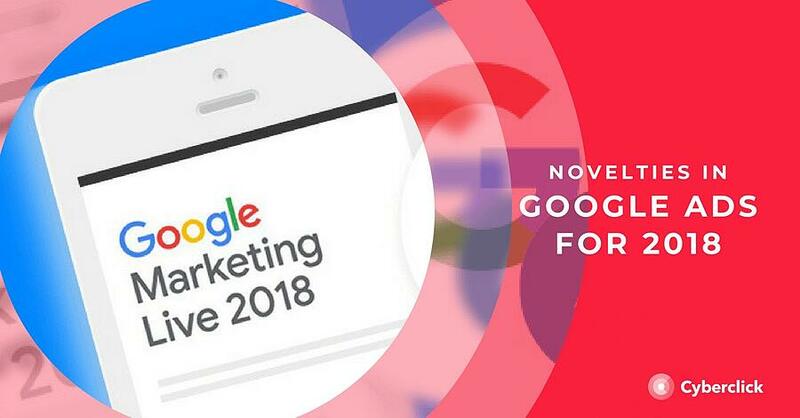 As part of the "Google Marketing Live 2018" event, the corporation has focused on presenting innovations in view of its platforms for advertisers. Cyberclick looked into Google’s announcements on Tuesday, July 10 in San Jose, California (United States) and this article serves to compile the ideas presented. Google had already launched the beta version of responsive search ads in May. In the next few months this tool will be available to all advertisers. Google says that this type of new ads will allow automated test ads to test how they work with the Google algorithm. Google has been urging companies for more than a year to stop directing their Google advertising efforts towards manual A / B testing. Additionally Google has been requiring advertisers to add at least 3 ads to each ad group as well as making it difficult for them to automatically rotate ads . With Responsive Search Ads it will make it easier for marketers and advertisers to make this step, towards automated A / B tests. We know that "near" or "local" searches have increased exponentially in recent times through mobile. When people are on the move they make instant consultations to be able to find products, services or companies that solve their needs of the moment. With the launch of Local Campaigns the goal will strictly be to bring traffic from the ads directly to the store, and these will not be designed specifically for SMB ads, such as Smart Campaigns. Local campaigns will grant stores visits using anonymous and aggregated data from Google users who voluntarily have their location history option activated. Google announced the launch of shopping campaigns optimized for goals starting in May, under the name of Smart Shopping Campaigns. The campaigns automatically optimize the ads in Google’s advertising networks, in order to reach the target conversion objective that advertisers have marked, such as sales or return on advertising investment (ROAS). On Tuesday, Google announced that advertisers will also have "shop visits" or "new customers" as their targets. Google is partnering with third-party commercial platforms. For starters, Shopify users can configure Smart Shopping campaigns from the same Shopify website. Advertisers can establish a new Smart Bidding strategy with the Maximize Lift option. This will optimize campaigns on YouTube when it comes to showing ads, by enhancing distribution to users who have seen a video of a brand that they liked. Nicky Retke, product manager of YouTube, during the Google Marketing Live 2018 even shared that the video platform experienced a 150% growth in ad conversions last year. Further, a study from 55 Youtube campaigns, performed in 9 countries, revealed that 70% of the campaigns reported a significant increase in store sales. Hotels are integrating their ads in Google Ads so that advertisers can access these campaigns. Google did the same with YouTube several years ago and this integration will make even more sense after the Google Ads rebranding. Some of the most anticipated news among Google’s audience in San Jose, California, was that now advertisers will be able to see reports of several devices in Google Analytics for the first time. Which means that marketers can now create and implement remarketing audiences between devices in Google Ads. For marketers Google’s changes require us to evaluate the implications Google Ads will have on our marketing strategy and determine how we plan to implement new features them in our online marketing strategy to our advantage.